The hotel/motelly goodness that inhabits the 3.71 acres of prime real estate at South Duke Street and the Freeway was likely built in the early 1970s, on land that had been cleared by urban renewal. Oh, cheer up and look on the bright side, Gary. it could be a lot worse: it could become part of the famous Sturdivant chain of derelict motels. Oh, and one other thing while I'm being a smartass: your picture of the motel makes me realize how much this building resembles our new jail. The motel has a little more glass and the jail has a little more concrete, but other than that they could be ugly stepsisters. Is there an Architectural Hall of Shame somewhere? Whoever designed these buildings makes Albert Speer look like Brunelleschi by comparison. I'm not sure the building would be much different as part of Sturdivant's SlumberSlums, although the grounds currently do lack a certain quantity of school buses, velvet paintings, and old appliances. And I suppose the windows miss a certain oprahphilia. This is the kind of building that exists on a busy street somewhere in Chicago or DC, but you never bother to look up at it. It just is a bland box that gives some mass to the street, and you're vaguely aware that it exists. Terrible corporate design that is really only at its nadir when put in an incredibly prominent location, by itself, like this. My wife's office used to use this hotel for stay-over guests in the late 1990s, but stopped after people started getting sick frequently. She jokes about it being a hotbed for Legionaire's. I don't think ANYONE else stayed in this hotel that weekend. Some of our friends noticed strange smells. And shortly thereafter, it closed. Great post, as usual. I find it especially frustrating that this structure (and the surrounding wasteland) serve as the gateway to downtown for people entering from the freeway via Duke St. Talk about an area ripe for a major overhaul. I had no idea that this building was extensively renovated before they tried to sell it off as condos - I do feel a bit sorry for the developer, or at least sorry that his money didn't end up somewhere more useful. It's hard to imagine people being interested in living here, given the general hideousness of the building and the stark sea of asphalt surrounding it on all sides. John's right on, too - this thing does bear a striking resemblance to the jail. The hotel is being torn down. I'm not sure what will be replacing it. It had been sitting vacant for a long time. 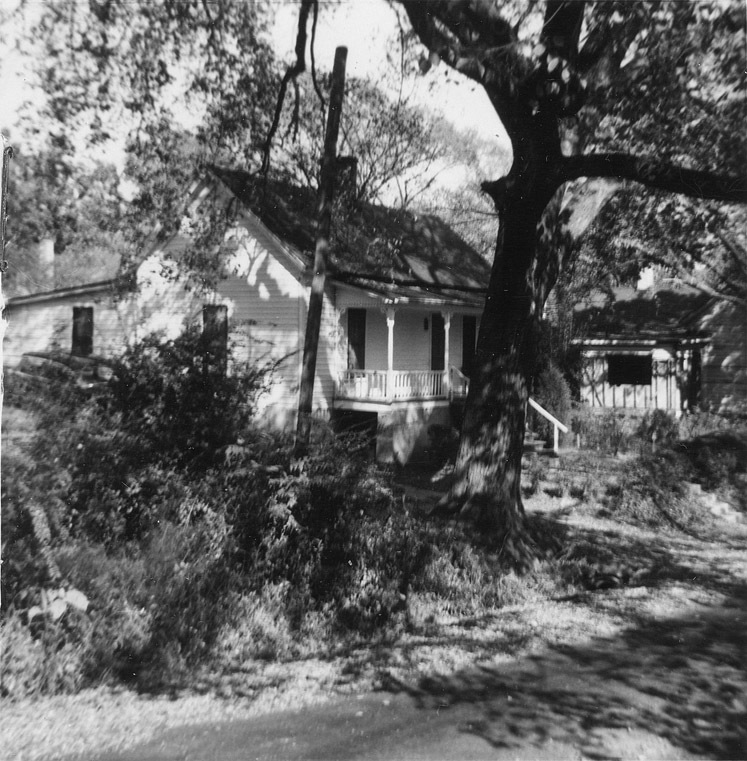 The site where the building and its asphalt rest once supported numerous small houses - 515-703 South Duke Street, 514-712 Willard Street, and the 400 block of Yancey Street. 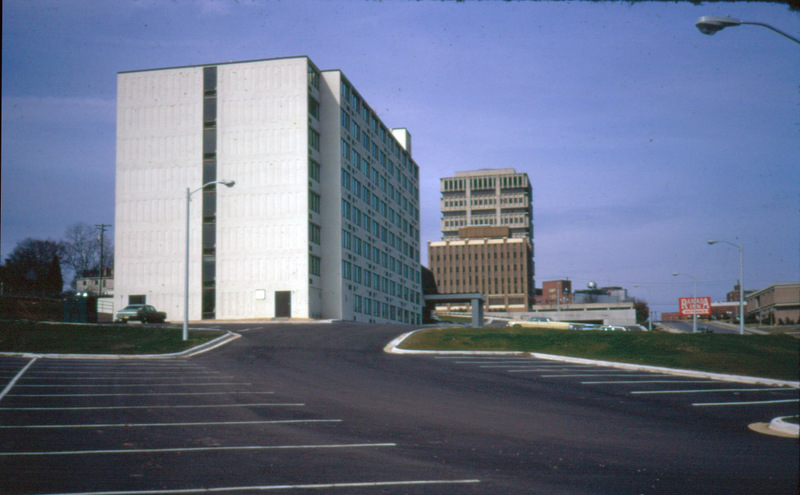 401 Yancey, looking southwest, 1965. 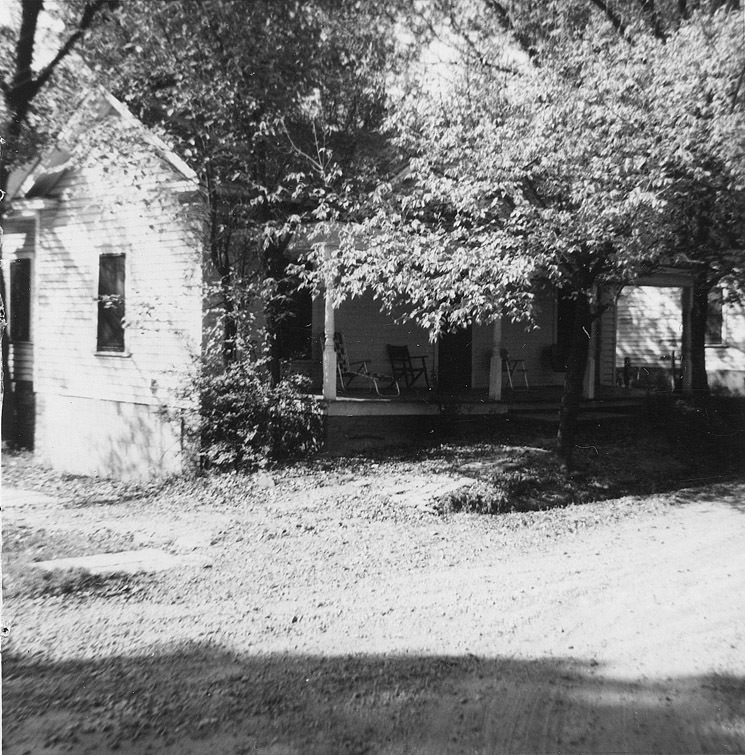 403 Yancey, looking southwest, 1965. 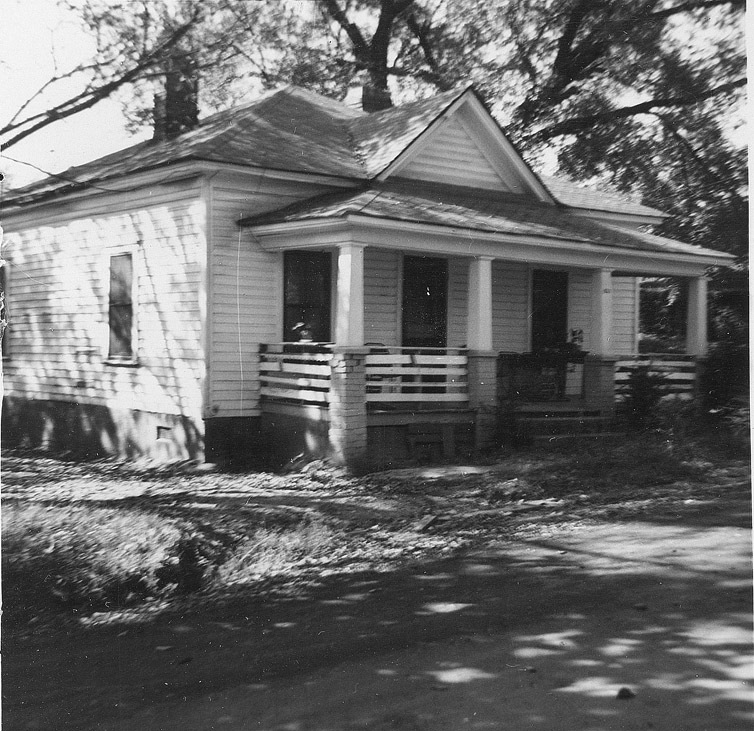 These houses were cleared by the city as part of the urban renewal program. The urban renewal program is a good demonstration of how people can become convinced of how a 'simple' solution will solve a complex problem. Problem: your city's middle class/businesses/retail stores are moving to the suburbs, where huge swaths of land allowed the construction of malls and shiny new cul-de-sac subdivisions. Solution: demolish huge swaths of land in town, consolidate dozens of parcels into one parcel, sell off to developers, who would create the suburban landscape - in the city. Yeah, it didn't work. Unfortunately, a significant reason why people moved to the suburbs was to geographically resegregate themselves racially and, first the first time at such a distance, economically. Didn't matter how bare the land was downtown - people weren't coming back anytime soon. So it sold off to car dealerships, and when private developers failed to materialize to build residential units, the government tried in their stead - thus constructing Forest Hills Heights, and later by funding development, such as Rolling Hills. In 1972, The 400 block of Yancey St. was shifted northward to make more room for a hotel (actually for all of the hotel's parking) next to the freeway, creating discontinuity between the 400 and 500 blocks of Yancey. By the time I knew of the hotel, it was a Ramada Inn, but I don't know if it started off that way. Aerial photo of the blocks, 1959. 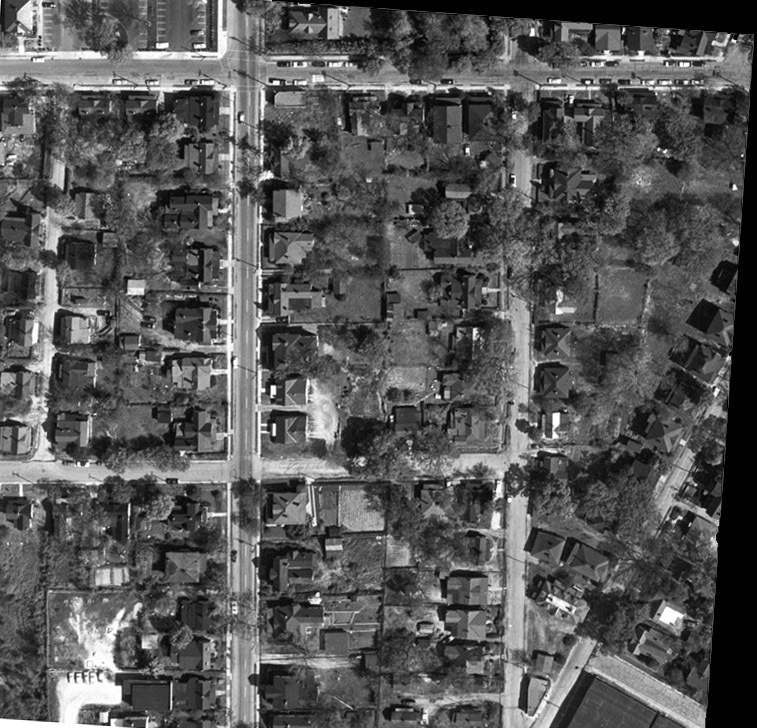 Same area from satellite, summer 2007. After simply becoming "Inn" for a few years, hosting a few nasty clubs and then sitting empty, the hotel was bought and significantly refurbished. The owner put quite a bit of money into it, and proudly took me on a tour several years ago. But I think he put a bit too much money into it, given that the building remained, and remains, inherently a piece of junk. I never saw anyone parked in the parking lot. He ended up selling it in late 2006 to good ol' Frank Wittenberg, of Duke Tower and formerly of Durham Centre fame. He mounted an abortive attempt to resurrect the building as condos, and it has sat shuttered for at least a year, owned by "DB DURHAM LLC" in Miami, FL. I really find this building ug-ly. I would shed no tears should it someday implode. Purchased in 2015 by Graduate Hotels, which, amazingly enough, plans to hipster-ize this hulk. "Alliance Residential Co., a Phoenix-based investor and manager of residential communities, would like to redevelop the former eight-story hotel at 600 Willard St. into a 340-unit apartment building with a parking deck." "The files submitted to the Durham City-County Planning Department reveal the apartment complex would be made up of two buildings, totaling 395,000 square feet, with one featuring a 145,000-square-foot parking deck with 440 parking spaces. The plans also show multiple courtyards and a pool. The taller of the two buildings would rise seven stories with the second building coming in at five stories." I assume this means replacing the current structure, which is about as un-urban as an urban building can get. Given that it's been abandoned for - well, forever - that's a good thing. I'd love to see some expansion of the definition of "downtown," which requires replacing the ring of 1960s-1970s suburbia that was urban renewed into existence around the loop. The structure was demolished in early 2018. The hotel is being torn down.